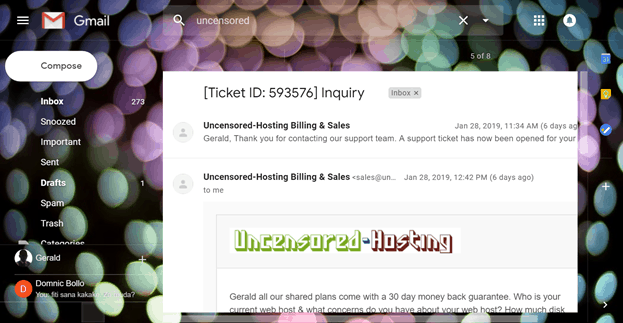 Uncensored-Hosting.com Review 2019: Is Uncensored-Hosting.com a Good Hosting? Uncensored-Hosting.com.com is a web solutions company based in the U.S. that offers reseller and virtual plans for web hosting services along with domain registration and transfer services. Uncensored-Hosting.com is a service of the parent company, Photography by Gus Video, Graphic & Web Design, born out of the innate need of a team of web professionals to find solutions to problems they experienced in the field. In addition to its web hosting and domain services, Uncensored-Hosting.com also maintains a very rich knowledge base that can answer all of your questions concerning web hosting. Each of the Uncensored-Hosting.com hosting plans has a cPanel/WHM that is easy to use and comes in very handy, especially if you have very little technical knowledge. It comes with tools that give you total control in managing your hosting account. There is also a demo version of it on offer, so you can try it out anytime and get a feel for it. Furthermore, it also provides free domain migration and transfers from other hosting providers, which is great for those with less technical knowledge. 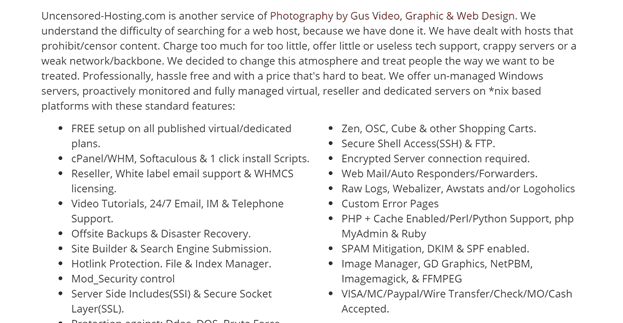 Even if your technical experience is more advanced, Uncensored-Hosting.com takes care of the headache involved in performing these actions. In addition to the standard packages for both its reseller and virtual plans, Uncensored-Hosting.com also has special packages that are tailored to meet the needs of its diverse clientele. You can’t fail to find a package that suits your needs when you choose this company. The packages range from 750MB disk space up to 12GB multi-domain offers that also have incredible features like SSL certificates, up to 150GB monthly bandwidth, 15 MySQL databases, ten domains and 20 subdomains, unlimited FTP accounts, email accounts, and aliases. Taking into consideration all of the features offered by Uncensored-Hosting.com across all of its packages, it has some of the most competitive prices in the market with offers including free domain hosting for 60 days. Its reseller plans are rather costly, but if you consider what you get with them, they’re quite worthwhile. Its virtual plans, however, compare favorably with competitors considering that they include free setup across all twelve plans, though with limited storage for the entry-level option. Uncensored-Hosting.com also has special plans that seem to be really inexpensive. For instance, the Uncensored-Hosting Matters plan is a time sensitive offer that lasts sixty days. It features one free domain, 8GB disk space, 1TB monthly bandwidth, SSL certificates, cPanel, and Softaculous auto-installer for free. However, if you purchase any of its plans and are dissatisfied, you’re covered by a 30-day money-back guarantee. No questions asked. The billing terms are primarily monthly, and payment methods supported include credit card transfers and PayPal. Its support system is also very helpful. It has a very wide knowledge base, and offers video tutorials and ticket submissions for customer service, which is specialized per department making response time very short and helpful. I tested the ticketing system and was pleased to receive a response within about an hour. Uncensored-Hosting.com is an American web hosting provider offering dynamic plans for personal and business use. It has a 100% uptime guarantee and great customer support services among several other fantastic features for customers at very good prices. Wondering how Uncensored-Hosting.com stacks up against other Web Hosting companies? Enter any other Web Hosting company and we will give you a side-by-side comparison.